No photo-op-hungry tourists died when a winter storm took down the Pioneer Cabin Tree in Calaveras Big Trees State Park, but damn if nature hasn't tried its darnedest the last 137 years. The saga of this giant sequoia began in the 1880s when its owners hollowed out the base of the tree as a roadway for cars. The 150-foot tree had a base 33-feet in diameter and a long fire scar along one side of it, which made the tree ideal for a tunnel job. It's unclear how old the tree was when it fell, but park officials confirmed that despite the years, the fire scar, and the tunnel, it was still "barely alive." Until now. A particularly brutal winter storm brought the tree down on Sunday at 2pm local time. It completely "shattered" upon hitting the ground, park volunteer Jim Allday told SFGate. Visitors had hiked through the tree just earlier that day. 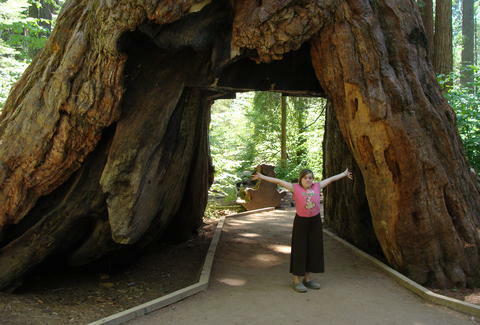 It was one of the most popular attractions in Calaveras Big Trees, and while cars were prohibited from driving through it in recent years, that didn't stop hikers from walking through it, carving their names for posterity, and wrangling their screaming kids for some cute photos. "This iconic and still living tree -- the tunnel tree -- enchanted many visitors," the Calaveras Big Tree Association wrote in a Facebook post. "The storm was just too much for it." Rest in power, Pioneer's Cabin. We'll always have the photographic evidence.